ABOVE: This aerial photo shows the area discussed in our article. For convenience, we've divided the hotel into three groups. (All are easily reached on foot from Alilaguna airport boat piers at San Marco Giardinetti (West, North) and San Zaccaria or Arsenale (East). The Piazza San Marco is the focal point of Venetian tourism, and it's especially popular with first-time visitors. From the trapezoidal plaza that Napoleon called "the finest drawing room in Europe," a tourist can visit St. Mark's Basilica, ascend the Campanile, admire the Torre dell'Orológio, visit the Museo Correr, tour the Doge's Palace, stroll the waterfront of St. Mark's Basin, catch a vaporetto, hire a gondola, sit in an indoor or outdoor café, feed the pigeons, buy souvenirs, window-shop for designer goods in the streets just off the square, or hang about and mill with the crowds. Should you stay at a hotel near the Piazza San Marco? That depends on your budget. You'll almost certainly pay more for a room near the Piazza than you would at a hotel that's tucked away in a quieter and harder-to-reach neighborhood. Still, the added expense can be worthwhile, especially if you're in Venice for only a few days. In this article, we've provided links for hotels that are within a short walking distance of the Piazza San Marco. Some of the links point to our Venice Hotel Directions pages, which have booking links and links to the hotel Web sites. Other links point directly to pages at Booking.com, Europe's no. 1 secure reservations service, which offers "guaranteed lowest available rates" at hotels, B&Bs, vacation rentals, and other properties throughout Europe. 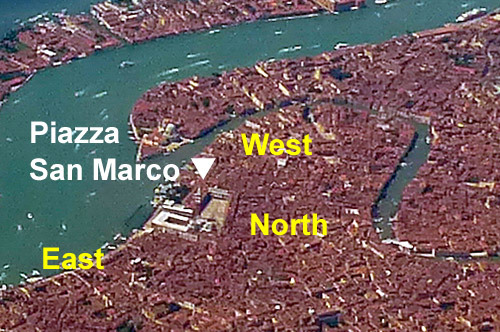 We've organized the hotels by area: west toward the Accademia Bridge, in the busy shopping streets north on the way to Rialto, and east along (and inland from) the Riva degli Schiavoni waterfront promenade overlooking St. Mark's Basin. Travel by public vaporetto (ACTV waterbus) from the Piazzale Roma or the Santa Lucia railroad station is slow, expensive, and unpleasant when boats are crowded. These hotels are best-suited to guests who arrive by Alilaguna airport boat or water taxi from Venice Marco Polo Airport.